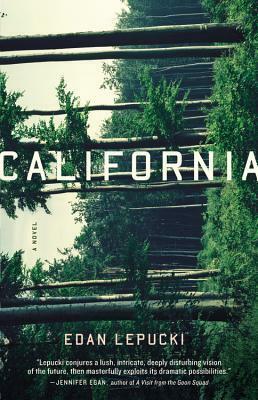 Today I'm featuring the opening paragraphs and a teaser from California, a debut novel by Edan Lepucki. This is one of many books that couldn't be preordered from Amazon because of the retailer's battle with publisher Hachette. As a result, Stephen Colbert asked his viewers to preorder the title from Powell's and other online and bricks and mortar stores, causing quite a sensation. I've only read a few chapters so far, but the storyline is engaging and I'm already concerned about what lies ahead for Cal and Frida, a young married couple who find themselves in unchartered territory. On the map, their destination had been a stretch of green, as if they would be living on a golf course. No freeways nearby, or any roads, really: those had been left to rot years before. Frida had given this place a secret name, the afterlife, and on their journey, when they were forced to hide in abandoned rest stops, or when they'd filled the car with the last of their gasoline, this place had beckoned. In her mind it was a township, and Cal was the mayor. She was the mayor's wife. Of course it was nothing like that. The forest had not been expecting them. If anything, it had tried to throw them out, again and again. But they had stayed, perhaps even prospered. Now Frida could only laugh at the memory of herself, over two years ago: dragging a duffel bag behind her with a groan, her nails bitten to s**t, her stomach roiling. Grime like she'd never imagined. Even her knees had smelled. First Chapter ~ First Paragraph #76 and Teaser Tuesdays was originally published by Catherine for bookclublibrarian.com. This post cannot be republished without attribution.